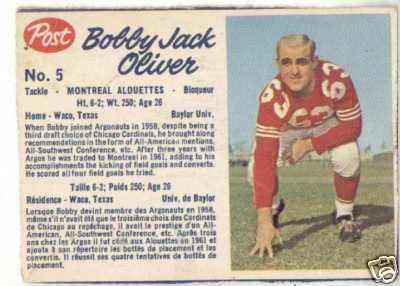 Bobby Jack Oliver was born in Waco, Texas and played college football at Baylor. Oliver was a second round draft pick of the Chicogo Cardinals in the 1958 NFL college draft. Oliver ended up coming to Canada and joinging the Toronto Argonauts in 1958 where he played three seasons (1958-60). Oliver was traded by the Argos to Montreal along with Paul Fedor and linebacker Ron Brewer for defensive end Doug McNichol and tackle Billy Shipp. Oliver played three seasons with the Montreal Alouettes from 1961 to 1963, winning East division All-Star honours at defensive tackle in both 1961 and 1962 (there were no CFL All-Stars until 1962). 1961 was an especially good year for Oliver as he won the Jeff Russell Trophy as the top player in the East. Besides playing defense, Oliver was also a pretty good kicker. In 1962, Oliver had 67 points for the Alouettes, good for sixth in the East. Oliver's success rate on converts (34 of 36 for 94.4%) and field goals (9 of 16 for 56.7%) were exellent for that era. 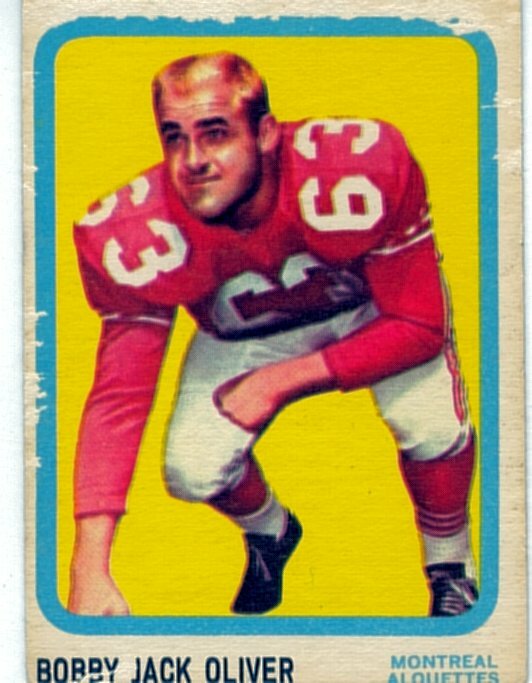 Oliver was traded to Hamilton for the 1964 season, and then sold by the Tiger-Cats in August to Edmonton where he finished the season. Edmonto released Oliver in March of 1965. Bobby Jack Oliver passed away on December 15, 2012.